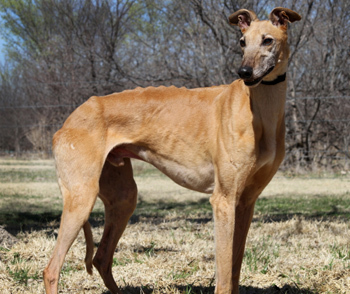 Luke, aka GLB's Sweet Luke, is a 9½-year-old red male born April 16, 2002. His sire is Gable Oscar, making his grandsire the famous Gable Dodge. His dam is GLB's Too Sweet. 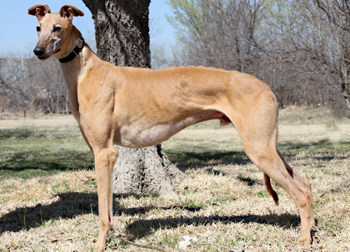 Luke has 21 races in Corpus Christi, Texas to his credit on greyhound-data.com, starting on November 23, 2003, and ending on June 16, 2004. Luke is a smaller male, but his heart is huge - one look in his liquid brown eyes, and you'll want to 'use the force' to bring him home! Luke is not cat tolerant. Luke is a great dog! He is very laid back, quiet, gentle, and well behaved. His coat is incredibly soft. He loves to go for rides in the car and is always excited about going on walks. Luke doesn't really play with toys that much, but every once in a while he will go crazy for about 5 minutes. He loves to be in the same room with us, and he loves to be petted. He is very easy to work with when it comes to baths and brushing his teeth. His house manners are impeccable. He crates well, but we also trust him when we leave him outside the crate. He is living as an only pet right now, but also gets along well with other dogs. Luke sleeps through the night on a dog bed in our bedroom, and learned to go up and down the stairs to get there. Luke just may be the perfect boy for you!